Conrad Louth struck an unbeaten 150 for Bourne against Grimsby. Conrad Louth clouted 150, but Bourne were still held to a draw by Grimsby in the Lincs Premier Division at the Abbey Lawns yesterday (July 25). Louth rode his luck thanks to some butter-fingered Grimsby fielders in the early stages before delivering a knock full of class and power. He struck 18 fours and four sixes in an innings that occupied 160 balls. It was the second ton of the Premier Division season for Louth and the second time he had reached 150 - he struck 151 against Market Rasen in May. Louth has now scored 666 league runs this season and only former Kiwi Test player Tim McIntosh of Sleaford has more. But the master batsman’s efforts couldn’t deliver a Bourne win. The home side posted an imposing target of 256-8 and Grimsby initially took up the challenge reaching 110-1 in 20 overs, but off-spinner Ben Stroud (5-16) applied the brakes and the the visitors were eventually forced to hang on for a draw at 193-9. Market Deeping were also left to cling on for a draw at home to title favourites Woodhall Spa at Outgang Road. 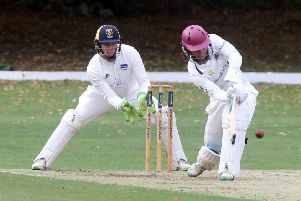 Deeping were set fair at 94-1 chasing 267, but former Sri Lankan international Malinga Bandara bagged five wickets leaving home skipper Dave Gillett (27no) to orchestrate some late blocking as his side closed on 163-9. Ajaz Akhtar (45) and Chris Jones (35) had given Deeping their solid start. Meli Adatia (5-49) bowled well for Deeping who stay fourth in the table, one place below Bourne. Spalding will soon be on life support at the bottom of the table. They are now 38 points adrift of safety after crashing by 121 runs at home to Lincoln. Chris Dring (3-37 & 42) was Spalding’s best performer. Bourne 256-8 (C. Louth 150no, R. Bentley 46, C. Wilson 23). Grimsby 193-9 (J. Farmery 57, C. Robinson 44, T. Dixon 2-45). Woodhall Spa 267 (E. Botha 54, S. Evison 54, M. Adatia 5-49). Lincoln 281-9 (C. Tomlinson 127, L. Robinson 59, W. Taylor 37no, C. Dring 3-37, C. Kearns 3-69). Spalding 160 (C. Dring 42, D. Thomas 21no, I. Smith 20, O. Smith 6-36).